BREMEN, Germany — With NASA’s decision to continue using an interim upper stage for additional flights of the Space Launch System, Boeing is working on changes to both that stage and a more powerful upper stage. In an Oct. 3 call with reporters, John Shannon, vice president and program manager for the Space Launch System at Boeing, said NASA has asked Boeing to look at changes to the Exploration Upper Stage (EUS) to improve its performance. Those changes were prompted by the decision NASA made earlier this year to delay the introduction of the EUS. That stage was originally planned to enter use with the second SLS mission, Exploration Mission (EM) 2. Instead, the first flight of what’s known as the Block 1B configuration of SLS has been delayed to the fourth SLS launch, likely no earlier than 2024. NASA has asked Boeing to spend some time to try and “optimize” the EUS with the goal of increasing the amount of additional payload it can carry. Such co-manifested payloads, such as modules for NASA’s proposed lunar Gateway, would be carried on the SLS underneath the Orion spacecraft. “We’re actively working through additional design opportunities to lighten the stage and increase its performance and take even more out to the lunar area, so that the Gateway can be built and we can get human boots back on the surface of the moon,” he said. Shannon said later neither the company nor NASA had a specific goal for increasing the EUS’ performance. “It’s a very open-ended discussion with NASA,” he said, describing it as an opportunity created by the delay in the stage’s introduction. “We have some really sharp guys. They’re going off and coming up with some really great options for NASA to consider.” Those options include changes to the stage itself as well as orbital mechanics techniques. 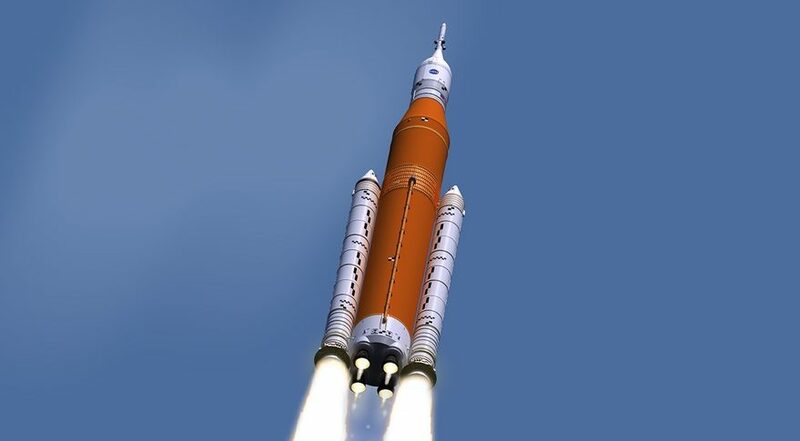 While he said there was no specific goal for that performance increase, he mentioned later in the call “all the work we’re going to do to try and get one or two extra tons of co-manifest payload.” NASA has previously advertised a co-manifested payload capacity of about ten tons for the SLS Block 1B. The decision to delay the EUS’ introduction means flying two additional SLS Block 1 missions with the original Interim Cryogenic Propulsion Stage (ICPS). One of those missions will be for EM-2, the first crewed Orion flight, while the other is being reserved for the launch of NASA’s Europa Clipper spacecraft to Jupiter’s moon Europa. Shannon said NASA is handling procurement of the additional two ICPS units from United Launch Alliance, which based it on the Delta 4 upper stage. That should be completed in the “next couple months,” he said. The ICPS was originally not planned to be human-rated, but will undergo some changes to be used on the EM-2 mission. The biggest change is the addition of an emergency detection system similar to one used on the Centaur upper stage of the Atlas 5 on commercial crew missions. Additional sensors and instrumentation will be added to the stage both for redundancy and to give astronauts on Orion more information about the status of the stage. During the call Shannon also addressed the schedule for development of the SLS. The core stage, for which Boeing is the prime contractor, has been on the critical path for the EM-1 launch in mid-2020. It has been running “neck-and-neck” with the Orion service module, as Mark Kirasich, NASA Orion program manager, described it a briefing earlier that day. “That’s a good characterization of it,” Shannon said. The focus is getting the core stage completed and delivered to the Stennis Space Center in Mississippi “at the beginning of next summer.” It will spend about six months there undergoing testing, including a full-duration firing of its four RS-25 engines.